BEIRUT -- Russian President Vladimir Putin caught nearly everyone by surprise with his Syria drawdown announcement. Little wonder: the Syria-led coalition forces had momentum behind them; they were on a roll, gaining ground sometimes even without a fight. Pat Lang, a former U.S. defense intelligence officer, noted that the so-called Islamic State appears to be "collapsing in Syria and Iraq. They are starving to death as the money runs out, lost to R+6 and U.S. air action against oil exports through Turkey. At the same time, equipment and men are not coming down the reciprocal transport route from Turkey." At this point, with the wind strongly behind him, President Putin calls a drawdown. It is not as if all has been settled militarily. Aleppo remains in limbo: partially encircled by jihadist forces, who themselves are surrounded by coalition forces led by the Syrian government and cut off from their supply lines. The fertile part of Syria that lies to the west of a line drawn from Aleppo in the north to Daraa in the south is yet to be secured. Eastern Syria, mostly desert, which is militarily of less strategic significance, remains largely in the hands of ISIS. And Turkey continues to nibble away at Syrian sovereignty, lobbing artillery shells over the border. Why did Russia begin a drawdown now, with so much still to be accomplished? What might it mean for the political future of Syria? Firstly, this is a drawdown but also not a drawdown -- depending how you look at it. 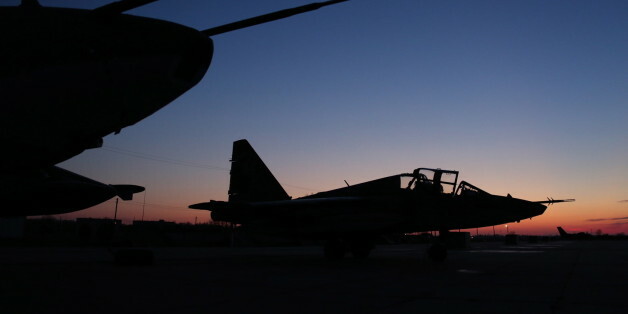 Those Russian airplanes that were designated to remain in Syria (and are not a part of the drawdown) are still actively supporting coalition forces on the ground, attacking insurgents who are not included in the ceasefire (principally Jabhat al-Nusra and ISIS). As one Russian military journalist told Radio Free Europe, "The fleet remains; antiaircraft systems remain; the tanks remain; all the marines remain; the helicopters remain; some of the aircraft will remain. Only some of the aircraft and their service personnel are being taken out. And they can come back, of course, in the space of three or four hours." In fact, the drawdown reportedly seems to have coincided with a planned rotation of aircraft and materiel -- necessary for maintenance after an intensive period of sorties. So call Putin's drawdown a rotation of forces if you prefer, a shift in tempo deliberately used to metastasize politics, to shock politics off the rails and onto new paths. It seems the Russian president may have succeeded in this: Secretary of State John Kerry is due in Moscow to meet Putin shortly. Actually, it may turn out that Putin's aim was never to kick-start negotiations between the different Syrian parties, but instead to corner Washington -- to force the Obama administration into genuine cooperation with Russia -- rather than have it standing on the sidelines, chanting the refrain of a Russia predicted to fall flat on its face in a quagmire. That said, catalyzing a Syrian political process in one form or another is surely a subsidiary objective. Putin, from the outset, has said that the Russian military intervention had limited aims and was designed to "create conditions for a political compromise." Putin's drawdown -- or rotation -- undoubtedly galvanized the political framework in various ways. It puts pressure both on Damascus and on those opposition groups participating in the Geneva talks -- lest all the Russian aircraft are, for some reason, forced to return. More than anything, it puts the onus on the U.S. to stop its allies (Turkey, Saudi Arabia and Qatar) from weaponizing and financing their proxies in this war. But can the U.S. impose this on its allies? Turkey is particularly problematic, as President Recep Tayyip Erdogan possibly needs the Syrian conflict to keep his hold on power. In short, one tangible effect of the drawdown may be that the political negotiations are kicked upstairs, from the (disempowered) participants in Geneva to the external actors who sponsor and finance them. This is not the first time that Putin has used a military drawback in order to try to galvanize a deadlocked political scene. Recall that in the lead up to the Minsk accords concerning Ukraine, Russia had temporarily turned off the military supply spigot to the Donbas militias in order to concentrate militia minds and perhaps to stop their military ambitions from running ahead of themselves. The common thread running through both the Ukraine and Syria conflicts has been the Russian leadership's overriding concern to deflect any Western or NATO dynamic toward confrontation with Russia. One of Putin's main priorities in launching his war on terrorism has precisely been to tease out some peer-to-peer cooperation with the U.S. as a prelude to resetting the relationship between both powers. The Syria drawdown positions Russia well politically as a serious state in search of a political resolution. It may soften European will to maintain sanctions against Russia. And it may also help better position Russia for whomever succeeds Obama in the White House: an America that perceives itself humiliated in Syria by Russia and its allies' military prowess is less likely to participate in any reset, and more likely to do the reverse. Aside from the question of whether the U.S. will respond, a question is left unanswered: What is it that Putin expects from Assad? In Ukraine, Russia sought loose federalism. But that seems inappropriate for Syria. So-called minorities have never been victims in Syria -- far from it. The Kurds were never treated as they were -- and still are -- in Turkey. Nor were Sunnis ostracized. They comprise the majority of the Syrian army today and have always been preeminent in the business world. Furthermore, Syria wasn't sectarian -- until recently when the creep of various forms of Wahhabism effectively sectarianized politics. Syria, after all, does have an identity. It is a proud and ancient nation. Syria, after all, does have an identity. It is a proud and ancient nation. Would Russia wish to see a weakened, loosely bound central government? Probably not. The war against radical jihadism is unlikely to be won through any accord reached in Geneva; it will endure. And Iran, Russia's ally, would certainly wish to see a strong Syria emerge in the end. Perhaps the U.S. would also see some merit in a strong Syria at a time when state structures throughout the Middle East are eroding and giving way to widespread human insecurity. But how to achieve it? Russia has said repeatedly that it must be the Syrian people who decide for themselves what government they want. This is Iranian policy too. But Putin cannot count on the Saudi-supported Syrian opposition arriving at an agreement with Assad in Geneva -- though he might hope this transpires. It is more likely he is relying on a Plan B. One aspect of the recent cessation of hostilities that has escaped much attention is how local ceasefires during this period of quiet have been brokered by Russian army officers -- usually quite senior officers. Their efforts have been met with striking successes. More than 40 such ceasefires have been secured. Perhaps, if the Geneva process fails, we shall see a bottom-up process take over instead. On the basis of these agreements, some of which have been negotiated by the United Nations and others by the Syrian government, local elections will eventually be held. Then regional. Then parliamentary. The constitution will be revised. And finally, presidential elections will be held under international supervision. In short, Syrians -- both at home and in exile -- would ultimately decide on their governance. But for this outcome to be viable, trust between Russia and America is essential. It must be built. These are the only real political choices now that regime change has been removed from the agenda: a global agreement reached at Geneva or a bottom-up process conducted by the Syrians themselves (accompanied by continued war against the radical jihadists). Putin's surprise drawdown announcement seems intended to expose precisely whether there is indeed any trust available to find a path through to an eventual solution. A lot rides on the outcome. This is not just about Syria. It will serve to shape the global order, one way or another. 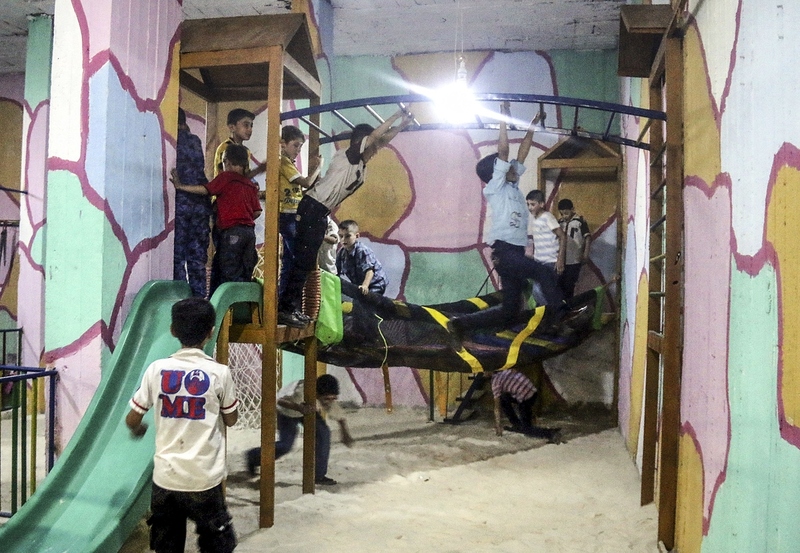 Syrian kids having fun at the subterranean playground, which constructed by activists for kids in order not to be affected bombardment of Syrian Regime, in East Gouta of Damascus, Syria on July 26, 2015.